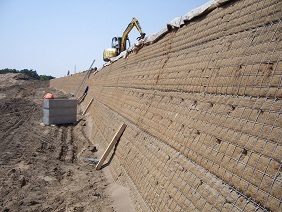 The GABION BLANKETS are a combination of our EROMATS stitched together with a fleece which prevents soil loss. A high quality EROMAT with a well sprayed fiber mix is necessary to protect the fleece from UV lights for extending its lifetime. Instead of using expensive rock fill material it is possible of using local soil material for reducing the construction costs. By selecting the right plants or seeds you will get a flush green wall and you create an additional environmental life space.